Cline Rents offers a number of excavators with different buckets and attachments to meet your needs for excavating in Kirkland. We try to stock the most useful mix for a variety of jobs needed by people wanting to do an excavator rental. Kirkland commercial operations and individuals alike will find we can often meet their needs. Excavators are extremely versatile machines that can be used in a variety of situations. While their capabilities overlap with other pieces of equipment in some areas, their ability to adapt to needs is almost unparalleled. We have a variety of attachments that make our Kirkland excavating rentals well suited to a range of needs. The association of equipment manufacturers (AEM) is an organization representing the interests of North American equipment manufacturers on the global market. Their vision is "To be the leading organization in North America enabling equipment manufacturers to be successful in the global marketplace. "1 They have put out a set of standard excavator sizes / classifications used across the industry. Excavators less than 6 metric tons are the smallest classification of excavators. They are the smallest of excavators and can fit into tightest spaces of any excavator. Combined with the right kind of trailer, these excavators can be hauled behind a truck with requiring a commercial drivers license. Those excavators above 3 metric tons are the most popular and are capable of doing a wide variety of jobs inside buildings and outside buildings for repair, upgrade and install especially in landscaping, sewer lines, foundations and utilities. Midi excavators run up to 10 metric tons. 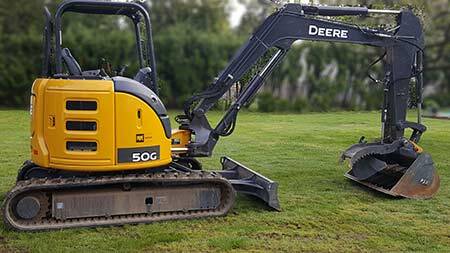 Also very popular, these machines can handle bigger jobs quicker and are used heavily in building construction, trenching and sub-division development. Many have zero swing radius like their little brothers and while requiring a CDL they are still easily trailered and transported. Standard excavators run up to 90 metric tons and are used for large commercial construction projects where speed and efficiency are needed to move large amounts of soil and materials. Most excavators in this category are not zero swing designs given the large counterweights involved. What size trailer do you have? Do you have weight restrictions on the surfaces where you will be operating? Do you have egress or ingress issues at the site? How deep of a trench do you need to dig? Are you using it to lift materials or do demolition? Is the reach sufficient? Many times in combination with excavation equipment we see people with the need for a dump trailer. It is great for loading and hauling debris and vegetation for smaller jobs. We do a good amount of dump trailer rentals in Kirkland. We are closely located and are open early and late for your convenience. Our dump trailers Check them out here.